Mariah Carey is singing softly in the background, I’m diffusing Holiday Joy from doTERRA, my room is twinkling with Christmas lights, I’m in my Christmas PJ’s, and The Santa Clause is ready to go on the TV so I can watch it right after I finish this post. Oh, and I put up my first full-sized tree, which I am ECSTATIC about! (My last apartment was very small and could only handle a 3-foot tree in the corner. Not satisfying.) Christmas season is HERE! If you’ve been following me for awhile, you probably know that I’m a huge Christmas fanatic and basically live for the time period between Thanksgiving and Christmas. Christmas isn’t actually my favorite day…it’s the season that I love! Christmas Eve is my favorite day of the year, if I have to pick one. I love jammin’ out to classic Christmas tunes, watching all of my favorite Christmas movies, snuggling up with tea or hot cocoa, decorating the tree, buying presents for people I love, baking holiday treats, and enjoying the fact that people are generally in a much more loving, giving mood. 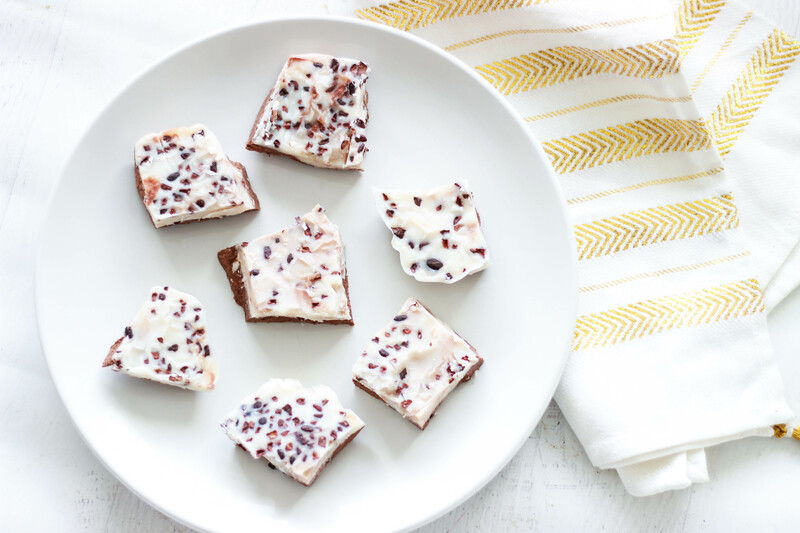 Since it’s the season of giving, I immediately wanted to make what was by far my most requested recipe for this season – peppermint bark! I asked on Instagram what holiday recipes people wanted, and I was surprised at how many people wanted peppermint bark, considering how simple it is! That being said, I loved the excuse to share my own twist on a holiday classic. Every year I always try to think of “Christmas” desserts, but that’s a flexible term. It’s not like Thanksgiving, where we all think of pumpkin pie. For Christmas, I think of hot cocoa, chocolate in general, eggnog, and gingerbread cookies. Peppermint bark, though, is definitely on the list. You know it’s Christmastime when peppermint bark is in stock at Trader Joe’s and Target is selling ornaments! I’ve only made peppermint bark a few times before, because usually I like something a bit more substantial. 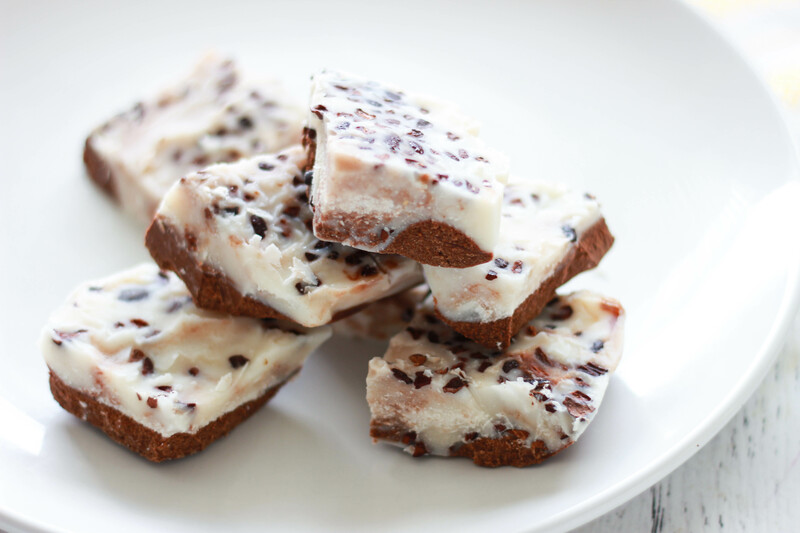 I used to snack on peppermint bark during the holidays when I was growing up, but it never blew me away the way other desserts did. 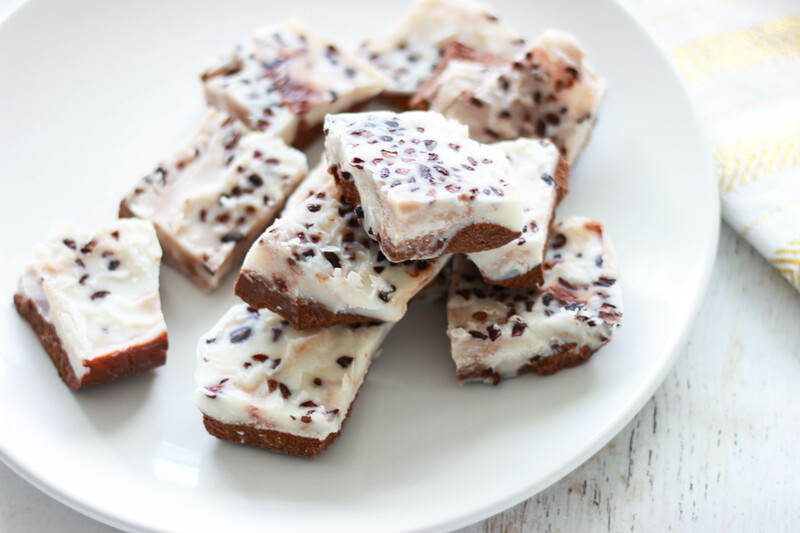 Homemade peppermint bark, though, is another story! 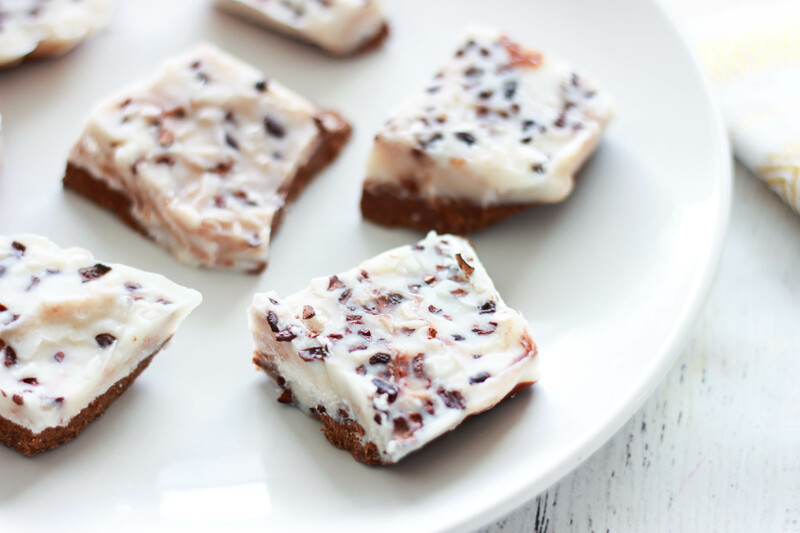 I like to make my peppermint bark a bit more substantial than a… bark. You know how peppermint bark is usually pretty thin and snaps apart easily? I know that’s how peppermint bark is traditionally made, but I would hardly consider myself traditional. 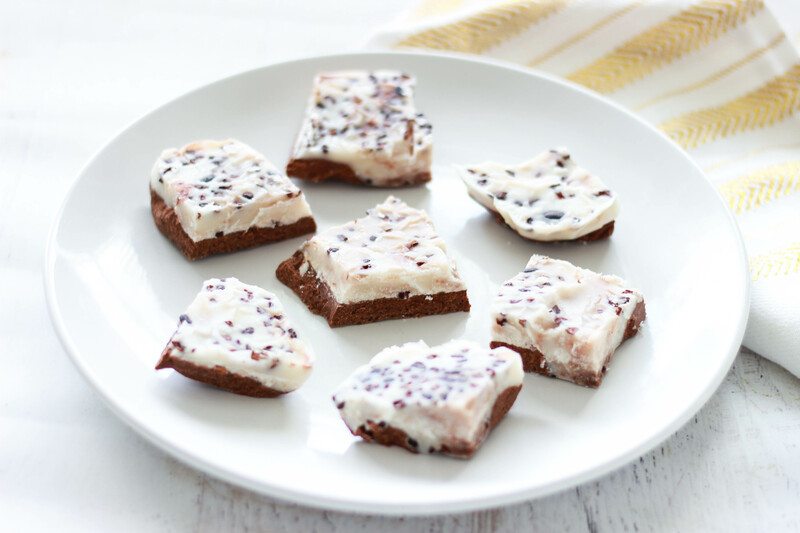 This peppermint bark is more like a cross between a bark and a bar! I mean, if I’m gonna have peppermint bark, I want a REAL piece with substance! 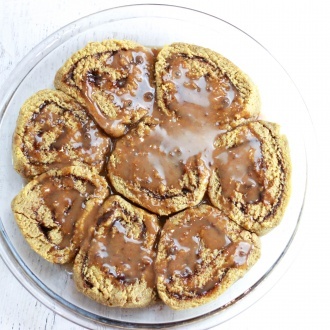 If you’d like the bark thinner, though, all you have to do is use a larger pan / baking sheet! 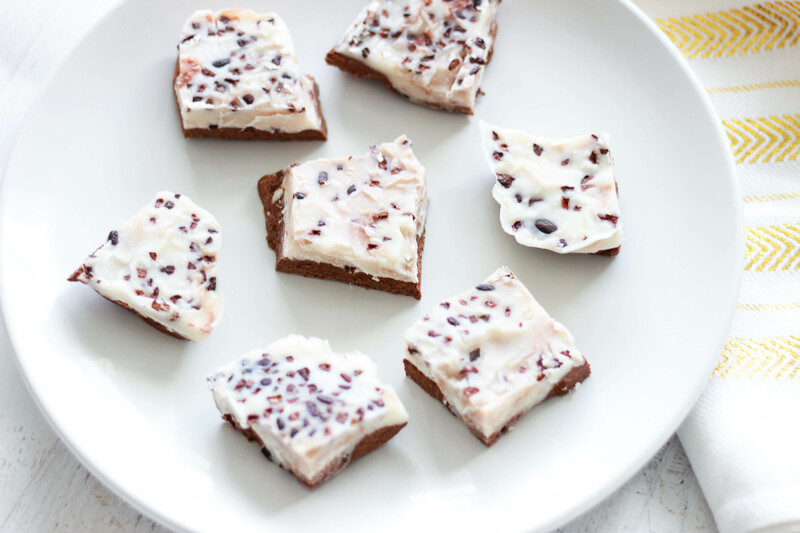 Since I’ve been on a sugar-free, sweetener-free dessert kick, I made this peppermint bark sugar-free and sweetener-free too. No maple syrup, honey, xylitol, stevia, erythritol, or any other sugar substitutes. 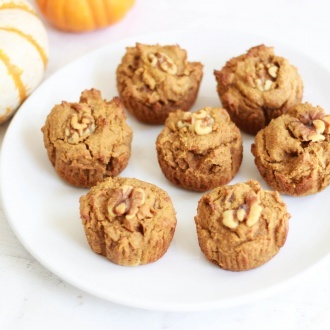 If you’re watching your sugar intake or following a low-carb or ketogenic diet, this is the perfect holiday treat for you! When it comes to adding sugar or sweeteners to recipes, my opinion is that there’s no point adding it if you don’t need it. Personally, I don’t think peppermint bark needs it. If you don’t have peppermint essential oil, you can also use peppermint extract. I prefer essential oils just because I would rather use the pure oil than an extract in alcohol or glycerin, but peppermint extract can also provide that same peppermint flavor. I recommend adding it in 1/4 tsp at a time until you reach your desired level of peppermint! 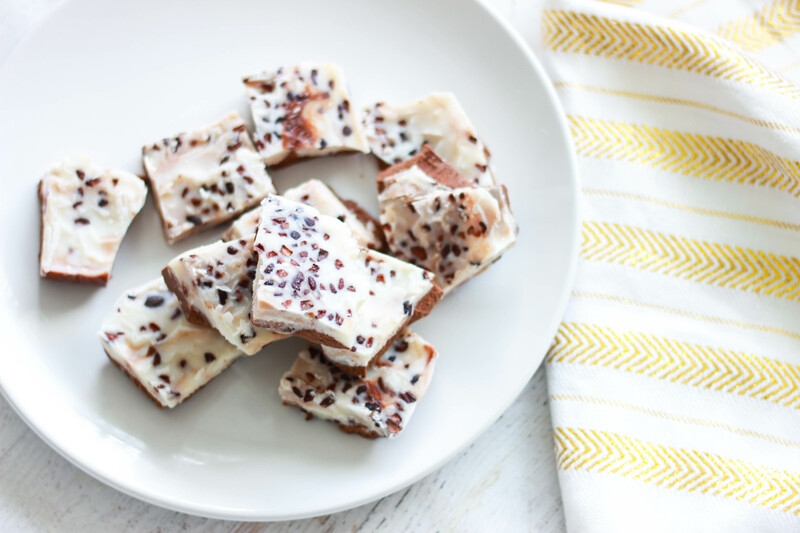 You can make this bark in two “clean” layers – the bottom strictly chocolate and the top white peppermint, or you can let them mix a little bit (which is what I like) to get a slightly swirled look! 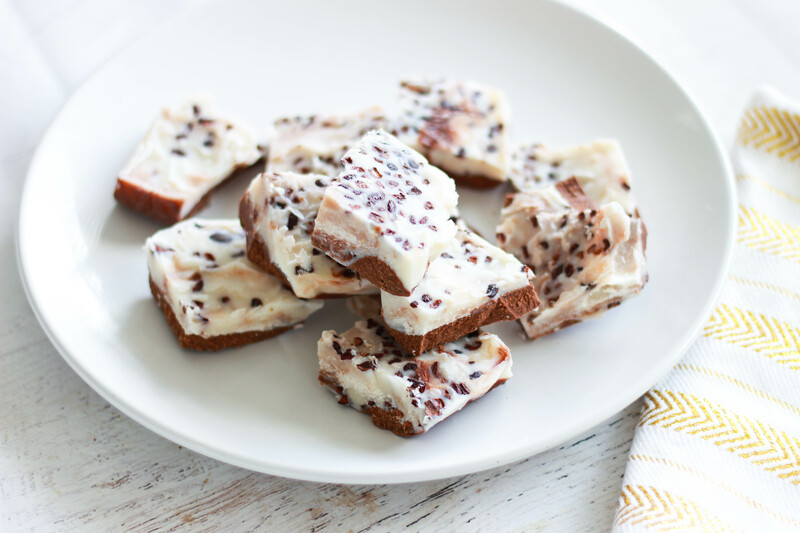 Peppermint bark is the perfect holiday treat to make because you can make a ton at once and store extras in the fridge or freezer for a long time! It will last all month (well, unless you eat it all – which you probably will), and longer. 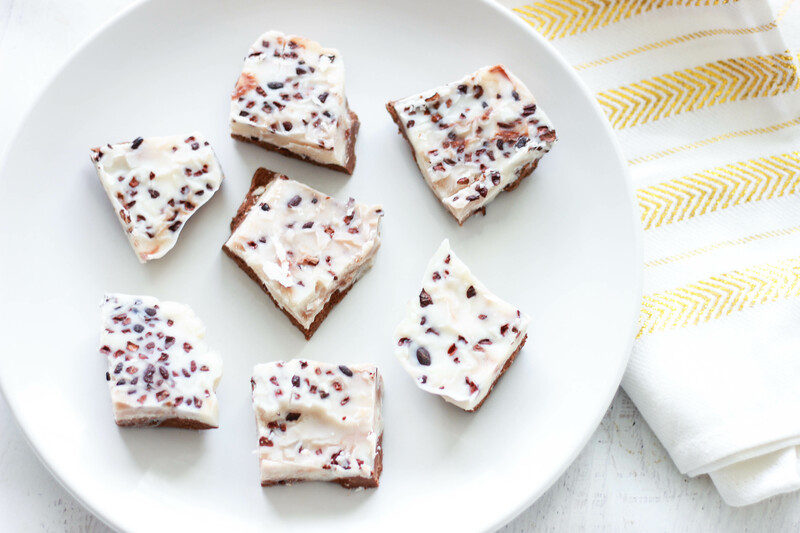 I know that people love to leave peppermint bark out for guests at this time of year, and this is the perfect version to offer because it’s allergy-friendly! 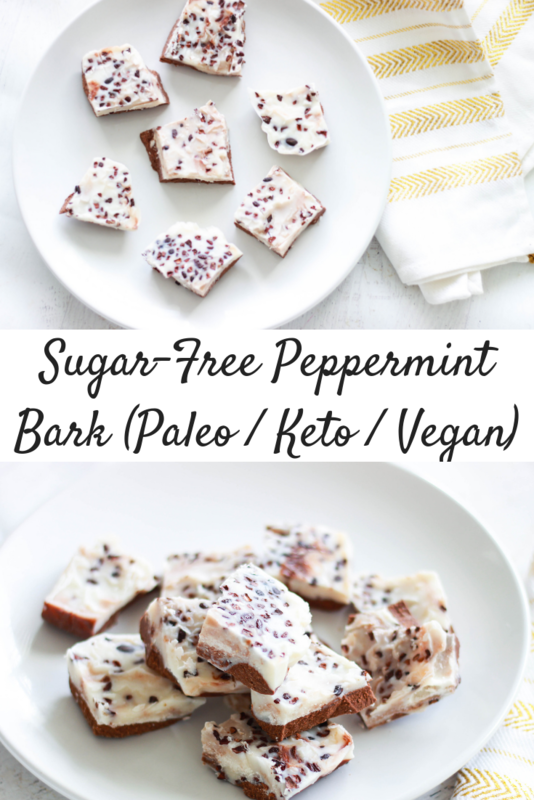 This peppermint bark is paleo, vegan, keto, sugar-free, soy-free, and nut-free! I mean, if I was offered this at someone’s house during the holidays, I’d be pretty impressed. 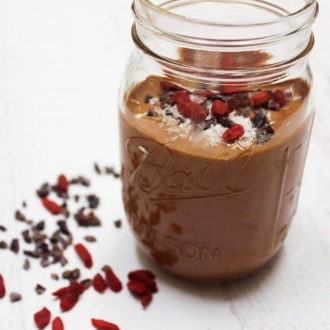 Feel free to add some crushed candy canes on top if those work for your body, or you can just use cacao nibs as I did here! 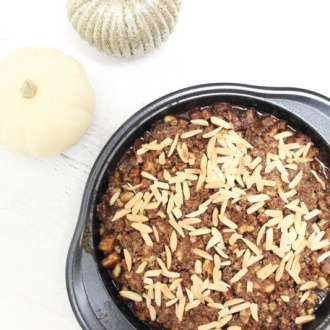 Line an 8×8 baking pan with foil or parchment paper, or grease well with coconut oil. I prefer to use foil so the bark can be removed easily from the pan after it’s frozen. Start by making the bottom chocolate layer. Melt the coconut oil and coconut butter in a small saucepan over medium-heat. Turn off the heat. Add in the rest of the ingredients for the chocolate layer and stir until combined. Pour the chocolate layer into the lined pan so that the chocolate reaches all sides and forms an even layer. Place in the freezer for 20 minutes. While the chocolate layer is freezing, make the top peppermint layer. Melt the coconut oil and coconut butter in a small saucepan over medium-heat. Turn off the heat, and add in the peppermint and vanilla. Stir until well combined. After the bottom chocolate layer has started to firm up (about 20 minutes), remove it from the freezer and pour the top white peppermint layer on top. If you want it to look more mixed / swirled, then pour the white peppermint layer on top before the bottom chocolate layer has completely firmed up so that they mix together a bit. 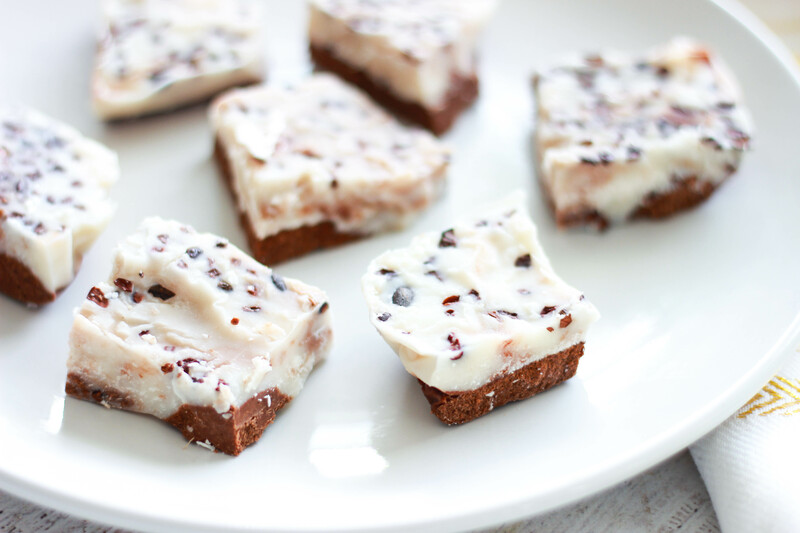 After you’ve poured the white peppermint layer on top so that it meets all sides, sprinkle cacao nibs on top evenly. Place in the freezer for about an hour, or until the peppermint bark has hardened completely. 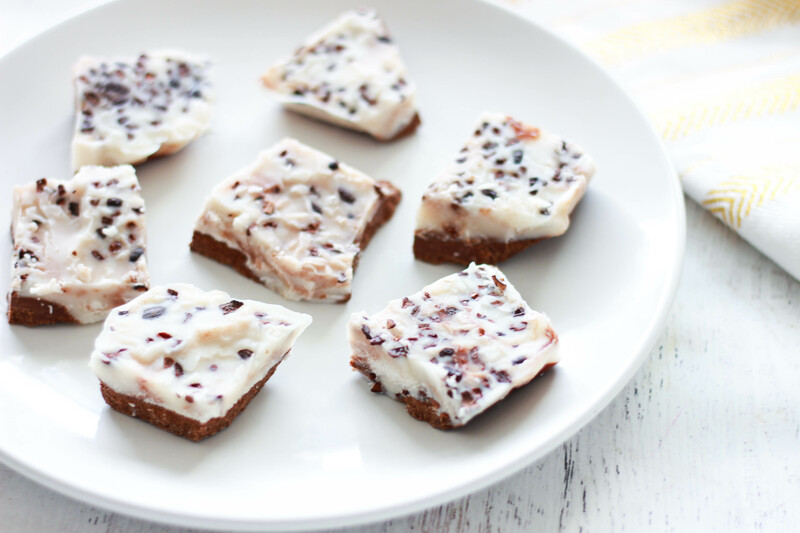 Remove from the freezer, and cut into squares or uneven pieces (I prefer to break them into uneven pieces). Enjoy! Store leftovers in the fridge or the freezer. ‘Tis the season! What’s your favorite treat at Christmastime?! Share below!